<>, What Do You Need In Your Home Gym? Some people just don't enjoy working out in crowded gyms. There is nothing wrong with wanting a little privacy while training. With a little smart shopping you really can get a great workout at home. Let's talk home workout equipment, shall we? A lot of your equipment needs will depend on things like your goals, gender, space requirements, budget, etc. In this article, I am going to give you a list of the basic things you'll need for general fitness, in-home workouts. If your goals are body building or sports performance oriented, you may want to eventually join a gym where you can enjoy more variety with equipment that is specific to those goals, or you may want to invest further in the stuff you'll need as you advance. For now, however, let's take a look at what you need to begin training at home. First of all you'll need enough space in order to perform the exercises with as little distraction as possible. A well-ventilated room with fans and a mirror or two to check your form will work. Secondly, you'll need a piece of cardio equipment for warm-ups and the cardio portion of your workout. This could be a stationary bike, elliptical machine, treadmill, etc., whatever you will do on a regular basis. These machines can range anywhere from a couple hundred to thousands of dollars. Obviously, you get what you pay for; however, you can actually get a pretty decent machine for around four or five hundred dollars. It's up to you, but you may want to consider springing for a bit more if you plan on daily use, especially if you weigh more than a couple hundred pounds. I have found from experience that the cheaper you go, the less comfortable they feel. Let's face it, if you hate the way it feels (not smooth, uncomfortable, not a good fit for your body, not well-built, etc.) you are probably less likely to use it on a regular basis. So do yourself a favor and get a machine that will encourage your adherence, not hinder it. While bells and whistles are not that important, you will want to make sure it offers different exercise intensities. I've found that often times the pulse meter doesn't work and the calorie burn count is way off from anything close to reality. Therefore, these things aren't really important. As long as you can time your workouts, change your intensity, and adjust the machine to fit your body, if applicable, you're good to go. All of these things are easily attainable at most department stores in the fitness section. Of course, if you want to get some extras like a pull-up bar, barbells, etc. that is entirely up to you. It's best to get a bench that is adjustable; one that can go from flat to incline at different levels is nice. You will need to purchase some dumbbells. The range of weights you will need depends on your gender and level of strength. Of course, you will need to buy these in pairs. Most females will need them ranging from 3 pounds through 15 or 20 pounds. Most men will need them ranging from 8 through 50 to get started. You can always add to your collection as your strength improves. You may want to invest in a barbell and some plates for variety's sake; however, this isn't necessary at first. Don't underestimate these little fellas; they can provide a very effective workout and add nice variety to your routine. They range in resistance intensity by color coding. They are relatively inexpensive compared to most equipment, so go all out and get one in every color. You can purchase these at department stores or online. I love these things almost as much as the stability ball...almost. Okay, these are definitely optional, but if you are going to be doing floor exercises an exercise mat will save your back bone and knees a lot of discomfort. Again, anything that will maximize your comfort may lend to adherence, so I say get it! The gloves will help your grip and save your hands from getting calluses due to gripping the dumbbells. Plus, they look cool. They feel good and are fun and inexpensive...I say get them! Come on...live a little. Get the gloves and mat! You can get these at most department stores in the fitness department or online. You can go as crazy as your imagination and budget desires here. Jump ropes are a great option if your knees can handle it. They have digital ropeless jump ropes now that track your calories burned, jumps, time, etc. They range from 35 bucks on up. Of course you can get an old fashioned one (rope included) starting at about 10 bucks. You may also want to get some other pieces of equipment such as a lat pulldown machine, leg extension and curl machine, chest press or fly machine, squat racks, etc. These can be expensive and take up a lot of space. 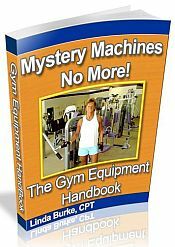 You can get a Universal machine (multi-station weight machine that has several of the aforementioned machines attached to it) which can be expensive and bulky also. Again, it is according to your budget and space requirements. Give it due diligence before going the expense and do some research before purchasing these types of machines. Once you have this equipment, you'll need to know what to do with it. Go to StraightforwardFitness.com for some great workout info or better yet buy my book, "So You Want to Work Out at Home...Now What?" It will be on sale at Amazon.com very soon! I will let you know when it launches along with the complete Now What? Fitness SeriesTM. Say! Did you know that you can follow me on Facebook? Well, you can! Jump on over to Facebook.com/StraightforwardFitness and "like" my page, please. I post a fitness tip daily. Feel free to leave comments and check in often. Thanks ever so much! In the next few weeks I will be launching my latest project. It is a series of Kindle fitness books that will be for sale at Amazon.com. The Now What? Fitness Series is a series of six books that will help anyone who wants to begin a health and fitness program know exactly what they need to do and exactly how to do it. In fact, I pulled the "Home Workout" article featured in today's newsletter straight from one of the books, "So You Want to Work Out at Home...Now What?" These books are succinct and easy to read yet jam-packed with need-to-know info without all the hype, fluff, and filler you'll find in other fitness books. I will send out an announcement before the actual release so you can be the first to take advantage of these great little time-saving, life-changing books! This exercise really hits the triceps in an extremely isolated way! It's definitely one of my favs! Have fun! To see a video of this exercise go to: Lying Triceps Cable Extensions. HEREIN LIES THE CHALLENGE: Go slow. Do Not Rush This. Pull out as many as you can working to failure. Always choose a weight that makes the last two very challenging yet still doable in good form. This video is meant to give you a 4-minute and 36-second break from the chaos of life. It is full of profoundly positive affirmations set to awesomely beautiful music. It's a mini-meditation that will send healing vibes throughout your body and out into your world. Simply by watching this, I believe you will help heal the Universe. Enjoy.